Graupner reportedly wanted his works burned after his death. Since the employer who had paid for them wanted nothing of the sort, they instead lay on the shelves of a library in Darmstadt, a city better known nowadays for a different kind of music entirely. Nowadays the online sheet music library IMSLP hosts excellent scans of what seem to be his complete manuscripts, a bold step by the Universitäts‑ und Landesbibliothek Darmstadt in making this dauntingly enormous body of work (1,400‑plus cantatas!) widely accessible. 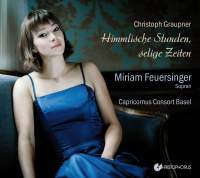 Although musicians such as Hermann Max and Klaus Mertens have dipped their toes in the waters and a smattering of cantatas has appeared among Geneviève Soly's Graupner recordings there is still an immense amount of work still to be done and this new release from the Austrian soprano Miriam Feuersinger, containing three recorded premieres, constitutes a major contribution to what is still an unfairly tiny discography. It can hardly have been difficult deciding which of these cantatas would come first on the disc. Angst und Jammer, Qual und Trübsal is a major discovery, venturing far into musical territory where Graupner rarely trod: he generally preferred a gentle diatonic simplicity to this sort of tortured chromaticism. Its opening is quite stupendous, above all from Feuersinger: her opening note is sustained with such purity that it scarcely seems to be coming from a voice at all. This is Baroque languishing of the highest and most seductive order and certainly one of the finest Graupner moments on disc. The central do capo aria 'Mein Elend drückt mich fast zu Boden' again allows Feuersinger to suspend long lines against an expressively dissonant string fabric. She reorders some of the passagework in the closing aria (singing F sharp, A, G, F sharp, rather than Graupner's F sharp, G, A, F sharp in the demisemiquaver runs) ‑ no great matter although it does disturb the parallel writing with the solo violin. Furcht und Zagen begins in a similarly anguished minor‑key mood, continuing with an aria in more optimistic chorale prelude style; its final aria features imitative textures ,and a triple‑time central section. tone, while the tempos have a naturalness that eludes Schmithüsen and Soly's successors, above all in the central 'Seufzt und weint' sequence. 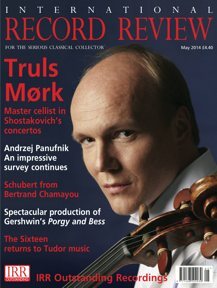 By contrast, the new recording is even slower than the tempos proposed by the 1926 Noack edition. The chorale melody of the opening movement barely hangs together, while 'Seufzt und weint' stretches out to over 11 minutes compared to Schmithüsen's and Soly's 7'49" ‑ certainly providing some beautiful moments but at the price of breaking the musical span. Still, even if not everything here lives up to the disc's stunning opening moments, there is certainly enough here to make this well worth investigating. Hear the opening of Angst undjammer at the very least: if that leaves you cold, Graupner might not be for you.